What Are Smart Airbag Systems in Cars? 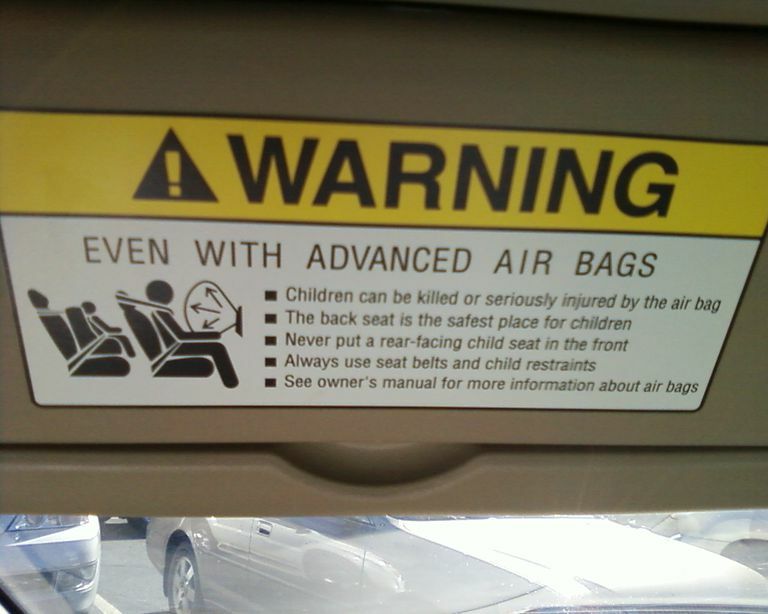 Even with smart airbags, it's still a good idea to secure children in the back seat. The history of the smart airbag can be traced back to the NHTSA’s original airbag mandate, which went into effect in 1994. At that point, the drastic increase in the installation base of the technology resulted in a dramatic uptick in airbag-related deaths and injuries. The immediate response was a public safety education campaign, which stressed the importance of always buckling children up in the back seat. Since a lot of the airbag-related deaths involved children, short-statured adults, and especially rear-facing car seats in the front passenger seat, that campaign was remarkably effective. However, concerns over airbag safety also led to new legislation and regulations. An 1998, the Transportation Equity Act for the 21st Century (TEA-21) directed the NHTSA to deal with the issue, and the NHTSA ultimately rolled out a “smart airbag” mandate. This mandate required all vehicles to use smart airbags by 2006, which has resulted in an explosion of advanced airbag designs in recent years. Traditional airbag systems consist of three basic components: crash sensors, an igniter, and an inflatable bag. The operation of these legacy systems is also relatively straightforward. If one of the sensors is tripped by a sufficient force, the ignitor goes off, which causes the bag to rapidly inflate. It’s a one size fits all solution for a significantly more complex problem. Smart airbags make use of a variety of additional sensors to determine whether or not the system should deploy. The most basic form of smart airbag simply has an embedded weight sensor in the front passenger seat. If the passenger is below a certain threshold, the airbag system will shut off. This is sometimes referred to as a seat occupancy detector, and the same type of system can also be used to trip a seat belt warning indicator or alarm. More complicated smart airbag systems also include other sensors. Some of these systems can determine the position of the passenger on the seat with ultrasonic sensors, which can allow the system to shut down if the passenger is too close to the dash. Other systems are capable of determining whether there is a car seat present, which will then prevent the airbag from deploying. Other smart airbags are capable of modulating the force that they use to deploy depending on the weight and position of the passenger. According to the NHTSA, smart airbags effectively reduce the chance of injury to children by 45 percent, making them one of the most important kids car safety technologies. The same study found that there aren’t any increased risks for adults who use smart airbags. So, at least on paper, it seems like smart airbags should save just as many lives as regular airbags without the unfortunate collateral damage associated with the older technology. However, smart airbag technology has experienced a number of hiccups over the years. Some of these systems will fail to turn on even if the passenger is technically heavy enough to warrant it, and a number of OEMs have even had to issue recalls to deal with such problems. One issue is the sensitivity of seat occupancy detectors. While both regular and smart airbags can and do save lives, the key is understanding how the airbags in your car or truck work. Airbag-related death and injury statistics can seem frightening, but a little education on the subject can mitigate most of the potential risk. If you always put rear-facing car seats in the back seat, properly restrain children, and seat them in the back whenever possible, you’ll face little or no danger from airbags, whether they’re smart or dumb. Short-statured adults, and anyone who has to sit especially close to the steering wheel when driving, will tend to benefit from smart airbags that can modulate the force of their deployments. However, features like telescoping steering wheels and power-adjustable pedals provide shorter drivers with an even greater level of safety.